THE extraordinarily enthusiastic reception given to Part 1 of Railway Wonders of the World is something that I shall never forget. How many welcome letters I have received, from expert, semi-expert and layman alike, I do not know, for they have not yet all been counted. But to every correspondent I extend my sincere thanks, and to every reader who has taken the trouble to write to me I shall in due time make personal answer. Meanwhile, I should like to comment generally on the nature of my correspondence. I am asked so many questions. Do I intend to deal in this work with all new speed trains? Do I intend to cover the interesting and ever-absorbing angle of the model railway? Do I plan to present adequate constructional details of locomotive building? Will Railway Wonders of the World be comprehensive enough to provide for the reader a complete survey of railway development? Well, I thought I had made all these things clear in Part 1, for the answer to each question is in the affirmative. Many enthusiastic readers have written to ask me what I am going to do about London’s Underground. I shall be dealing with this absorbing subject in Part 3, to be published next Friday. The story behind the planning and the construction of the finest underground system in the world is a truly remarkable one and has a fascination all its own. Then A. N. (Littlehampton) desires that his interest in tunnelling shall be catered for - an easy matter, for in the issue now before you there is an arresting chapter on the construction of the famous Cascade Tunnel. I am particularly pleased that so many readers have written to say how much they appreciated the coloured folding plate of a “King” class locomotive presented with Part 1 of this work. Some readers have inquired whether this plate gives every detail of a modern locomotive’s con-struction. 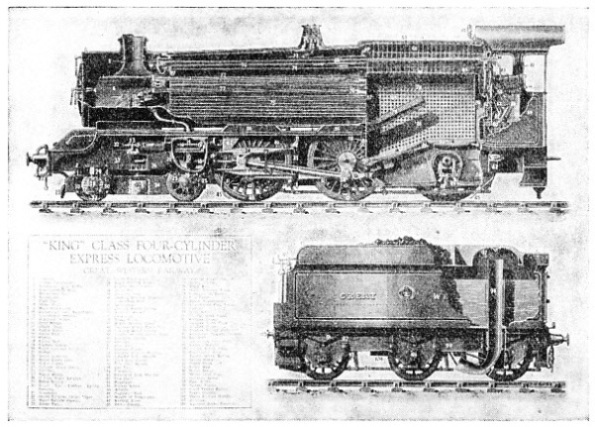 For various cogent reasons this is not practicable on a sectionalized drawing, but everything necessary for a proper understanding of the locomotive’s interior is included. THIS small reproduction gives an impression of our magnificent three-colour folding plate, presented in Part 1 of “Railway Wonders of the World”. With its accompanying article this plate clearly demonstrates the working of a modern express locomotive. There are still a few copies of Part 1 available. FOR many months now I and an expert staff have worked and travelled; and we have gathered round us competent railway writers from all over the world that this work might become a practical and an important venture. I believe that it is a practical and important venture, and my correspondence would appear to bear out that fact. When the work is finally bound it will form the most complete story of the railways. I SAID said just now that we have travelled to help to make this work as accurate as possible. Only recently I went to Germany to experience first hand the “Flying Hamburger”, that does the journey between Hamburg and Berlin, a distance of 178 miles, in two hours eighteen minutes. The authorities gave me a special permit to enable me to sit with the motorman, and those of you who have not yet made the speed of a hundred miles an hour in the front of a train have yet to know what speed really is. I did the double journey - Berlin to Hamburg and Hamburg to Berlin - the first through more or less fine weather, and the second through fog. But the system of signalling is so efficient that on the trip from Hamburg to Berlin we were not more than eight minutes late. That, I think, is an achievement, even allowing for the fact that the track is more or less straight. The “Flying Hamburger”, with which we shall deal fully in a future part, is an example to the world in speed-train design. She is driven by Diesel motors of 410 horse-power, and. while at the moment a certain amount of trouble is experienced from time to time, this train is one worth watching when it comes to fast travel. The “Flying Hamburger” is by no means yet perfect - but she is on the way, and I am willing to prophesy that for speed she will ultimately be in the first rank. Incidentally, while we are in no way concerned with politics, it was an interesting adventure to be expected to Heil the Fuhrer to gang workers during the trip. The driver did this during the whole journey - but there wasn’t much time in which to return the salute, considering the amazing speed of the train. Another interesting development in the progress of modern speed trains is that of the Bugatti Autorail, petrol driven. The driver is amidships of the train, so that passengers in the front coach have an uninterrupted view. It is, in fact, the ideal observation car, as I found out when I journeyed from the Gare St. Lazare in Paris to the port of Le Havre. Leaving the station with an absolutely unimpaired view is an unforgettable experience. The journey from Paris to Havre is not so fast as that from Berlin to Hamburg, as the route is less direct and there is one stop at Rouen. This train is very well supported by the French travelling public, and there are similar trains on other routes in France. You will find illustrations of the Flying Hamburger and the Bugatti Autorail on page 38 of this Part. The French state railways have produced railcars (as they call them) capable of running at speeds which in carefully controlled tests have attained an average of 185 kmph (115 mph), with a maximum speed of 192 kmph (120 mph). These railcars have been put in use for several fast services, and easily attain a commercial speed of 110 kmph (69 mph). The cost of a 70-seat railcar is just under £15,000, including engine. The railcar has attained a speed of 192 kmph (120 mph) during the test held last October. Nor is Great Britain neglecting this form of transport for branch-line services. The Great Western Railway has for some time been experimenting successfully, with heavy-oil engines for fast speeds. A picture of the GWR streamlined train, will also be found on page 38.